Abraham Kovoor’s Case Diary: Rifai Ratheeb - Unravelling a Muslim Miracle! "All these act here described I actually witnessed. There was no fake about it. I closely examined the injuries afterwards. I must confess I would never have believed some of these feats were possible had I not seen them myself. .. I was astounded. How they escape hemorrhage, at least in the form of extensive extravagation is more than J can tell ... "
In September 1964 I had a letter from a Muslim gentleman inviting me to see a Rathib ceremony on the 3rd of October 1964 at "Majumal Kairath" on Nimal Road, Bambalapitiya, by one A. Abdulla and party. After an early dinner that day I went to that place with a member of the Ceylon Rationalist Association. We were received by the official in charge of the ceremony, and were given 'ring-side' seats. The performance was arranged to take place in the open garden. An area of the size of a badminton court was roped in. In this rectangular plot about two dozens of able-bodied men, in two rows facing each other, were seen singing devotional songs with the accompaniment of tambourines. The chief priest with two assistants was at one end of the two rows. The whole place was very well lit with numerous high powered electric lights. The garden surrounding the roped-in area was crowded with a thousand or more spectators. At about midnight, one of the assistants of the priest opened a box and brought out numerous shining weapons of various types. There were two swords, six knives with sinuous blades, twelve daggers with ordinary handles, six daggers with abnor­mally big wooden handles which were spherical and of the size of large husked coco­nuts, and a large number of thin long needles. Apart from these weapons, he also brought out a light plank of about two feet long, one foot wide and half an inch thick. Though there was no chance of our examining these weapons at close quarters, from the glittering shine on the blades, it looked that they were made of either silver or electro-plated iron. The priest handed over these weapons one by one, after a sham enchanting, to selected persons from the 24 acrobats. From their performance one could come to the conclusion that there were in the troupe persons specially trained for specialized feats. Each acrobat received his weapon with devotion after worshipping the priest. While the unarmed men in the troupe continued the chant at a louder and quicker tempo, the performers started jumping about in the arena with the agility of panthers mimicking the acts of cutting and stabbing themselves. They wore no shirts on their bodies. Some four persons who had the knives with the sinuous blades finished their hopping about with a high jump into the air. They landed on the ground after the high jump with their bodies bent forward enabling their abdomen to recede far back. Just at the moment of landing on the ground the performer finishes a slashing movement of the knife against his encaved abdomen with lightning speed. After the slashing act he stands in the bent position holding the abdominal wall with his left hand under the pretext of preventing his intestines coming out of the non-existing wound. The priest now comes forward, pretends to make a magical movement with his hand under the pretext of curing the wound. The slashing act in this acrobatic performance is so cleverly and quickly done that the spectators would think that the performer had actually cut his abdomen. In reality the knife passes without touching his abdomen. In one case I saw a person with two bleeding slits across his abdomen. Probably he might have been one who had not reached the high degree of required dexterity; hence the tip of the blade must have cut the skin of the abdomen. When such superficial cuts were made accidentally the prayer by the priest did not stop the bleeding. The fraud in this act can easily be exposed if one among the spectators could get into the arena before the priest comes to affect the magical cure, and examine the abdomen of the performer while he is pretending to hold the slit-opened stomach. To his astonishment he will be able to see that there is not even a scratch on the abdomen. I would advise the educated Muslims of this country to conduct such a test at the next Rathib ceremony. It will be helpful to prevent a few cunning persons from cheat­ing the gullible public. A world religion like Islam does not need the support of such frauds. It is possible that the priest might object to such a scrutiny on the pretext of desecration. It must always be taken for granted that if objections are raised against scrutiny on the ground of desecration, there is sure to be hidden fraud. Another similar act is the sham stabbing on the abdomen with a dagger. Here too, the performer leaps high up in the air and mimics the act of stabbing just at the moment of landing on the ground in a bent position. He remains in this bent position with about three to four inches of the dagger buried in the fold of the abdomen till the priest comes to his sham rescue. He even pretends that it is difficult for him to pullout the 'stuck' dagger from the abdominal wall. To make it realistic he pinches the ab­dominal skin round the tip of the dagger on to it till the priest comes to affect the fraudulent cure. Finally the priest comes, pretends to say some manthrams and pulls out the dagger which has not even made a skin-deep wound. The performer proudly shows to the spectators his abdomen so that they may admire the miraculous powers of the priest to cure stab wounds. Like the cutting act in the former case, this stabbing act too is so quickly done that the spectators would be easily duped into the belief that he has actually pierced the abdomen. The disappear­ance of a few inches of the dagger from view into the fold of the abdomen will give the onlooker the necessary illusion. Here too the fraud can be exposed if one of the spectators goes forward and examines the abdomen before the priest attempts the mumbo-jumbo cure. A third act is the sham driving of a dagger into the abdomen by hammering. The dagger with the large wooden handle weighing about three pounds is hammered into the abdomen. The hammering is done with the light plank. Only fools and small children can be duped by this simple trick. The secret in this fraud lies in the following three facts. The part of the body selected for driving the dagger in is the boneless abdomen which can yield to pressure like a sponge. The blunt tip of the dagger could be pushed into the relaxed abdomen to a depth of one or two inches without causing any wound. The thin plank is selected for hammering purposely to produce maximum sound and minimum force. The heavy handle for this dagger is purposely made. If a force X can drive an object weighing 1 ounce to a distance of 10 inches, the same force will drive an object weighing 3 pounds only to a distance of 1/5 of an inch. If a person lying on the ground can support a grinding stone on his abdomen, he can allow another person to hammer on it even with a sledgehammer without any feeling of dis­comfort. Almost all the force of the hammering will be absorbed by the heavy grinding stone. Similarly when the heavy handle of the dagger is hit with the light plank, it imparts no effect on the abdomen. If the dagger is without the heavy handle, the force of hammering even with the light plank will have some effect on the abdomen. How thrilling it would be if one rational minded Muslim among the spectators walk into the arena while this performance is going on, and show that he too can do the same act without wounding his abdomen? Such person will be doing a great service to his community by exposing this mass fraud. A fourth act I saw was the piercing of the boneless parts of the body like the cheek and folds of skins and flesh with sharp long needles. One elderly person was seen to perform the only difficult· act which deserved admiration. He passed a long needle through his neck avoiding the pharynx and the larynx. In dexterity this act compared favorably with the one I saw many years ago when a performer in a circus troupe sent a sword through his upturned mouth into the gullet to a length of about one foot or more. The skill in this performance was his ability to keep his upturned mouth in a straight line with the gullet, and his capacity to relax the muscles of the throat. His performance, like that of the person who sent the long needle through the flesh of the neck, depended on the skill developed through prolonged practice, and not on any divine power. Since the performer in the present case was in a semi or totally self-hypnotized state he would not have experienced pain. There is no mystery in a needle wound not bleeding. 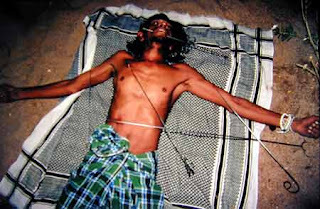 Similar piercing of flesh under hypnotic trance can be seen at temples and devales. Unlike incised wounds which cut across blood capillaries and arteries, needle wounds do not bleed. Doctors' hypodermic syringes, even if they are sent into the veins for intra-venous injections do not cause bleeding like incised wounds. The final act was a sham cutting of a man into two by a sword. Like the third act in which a man was hammering a dagger into the stomach, this too could dupe only fools and small children. A man lay on the ground with face upward. Another per­former brought down a long sword on the bare abdomen of the prostrate person with pretended great force from a height of about 8 feet. Though the sword is brought down with considerable force, that force is broken just when it is about to touch the abdomen. The blunt blade is then pressed to sink two or three inches into the relaxed muscles of the stomach. At this moment another person covers the body and the sword with a bed sheet. While in that covered state the performer moves the sword forward and backward pretending to cut the person into two. The loose skin and the relaxed muscles of the stomach allow the blade to move forward and backward with­out inflicting any wound. At this stage the priest waves his hand over the body with a mumbo jumbo prayer. The cloth and the sword are then removed. The so-called cured man gets up and shows his 'cured' abdomen to the spectators. Apart from acrobatic feats and tricks there is absolutely nothing mysterious in Rathib ceremony. They are definitely interesting performances suitable for entertain­ment at gatherings. But to claim that they are done with divine powers is pure fraud and absurdity. Such ceremonies, in the name of religion will make gullible persons more gullible. Like all other acts, the fraud in the final act also could be exposed if one among the spectators goes forward, removes the cloth and examines the abdomen of the prostrate person before the so-called 'cure' by the priest. Credit will have to be given to these performers for the skill they exhibit. Such skills are only like the skills shown by the circus acrobats. I had an interview with the priest Mr. A. Abdullah at his residence at Prince Gate. The talk I had with him confirmed my own analysis after seeing the perfor­mance at Nimal Road, Bambalapitiya. If scientifically-minded persons like Dr. Spittel, Messrs. Basset and Bantock could be deceived by the so-called 'miracles', is it surprising that thousands of spec­tators who watch Refai Rathib are hoodwinked?